Did you ever wonder how J.Crew stylists always perfect the technique of rolling up shirt sleeves? Seriously, I can not be the only one that ponders these things. Whenever you look at a J.Crew ad, catalogue or even their store mannequins, the cuffs are always perfect (relaxed, not uptight but stylized.) Well wonder no more my dear readers because yesterday Who What Wear had a post on this topic. Gayle Spannaus, the head womens stylist at J.Crew shared the technique with Who What Wear and I am going to share it with you. 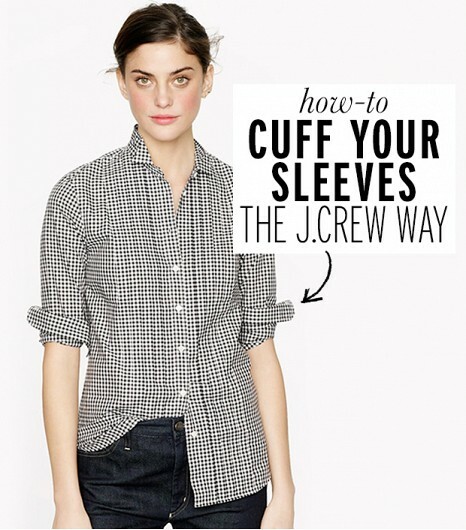 Here it is the 5 step to How to Cuff Your Sleeves the J Crew Way. Enjoy your weekend and roll up your sleeves (the J.Crew way). I have never been able to get this right! Thanks.